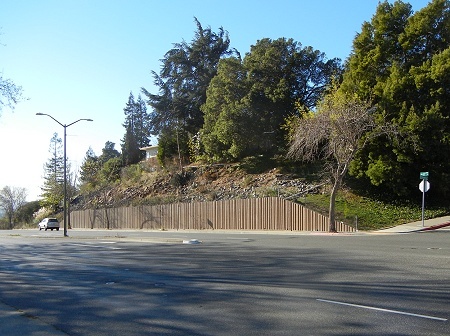 If you’ve read this blog over the years you’ve seen me talk about the Piedmont block, a big hunk of Franciscan rocks riding north along the western side of the Hayward fault. Its easternment end tails off in a narrow wedge of undifferentiated rock, shown here in the geologic map. The next three photos are taken from the locations marked with numbers. That’s 35th Avenue there, right at the curve in the road where it becomes Redwood Road. The curve is where the fault crosses the road, too, so it’s an apt place for the change of name. Just below the bend is this roadcut in hard bedrock. 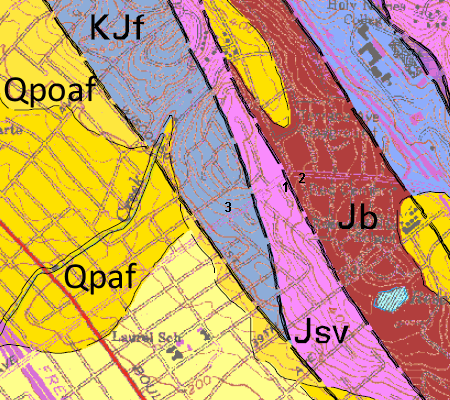 It’s mapped mostly as the material labeled KJf, undifferentiated Franciscan, on the geologic map plus some of the volcanic rocks (Jsv) exposed in the Leona quarry. I don’t know how old the roadcut is. The road hasn’t changed course since the 1800s, but I guess it was widened in the 1960s or so, because the map base shows the split roadway in purple, meaning a recent change of the same vintage as I-580’s construction. Perhaps the road had a hump in it as it crossed the ridge. Above the bedrock ridge is a small valley with Jordan Road in it, shown below. The homes on Victor and Herrier Streets are visible on the Franciscan ridge beyond this swale (especially in the big version if you click on it). A bit to the north, Peralta Creek runs into this swale (mapped as a sag basin related to the fault) and then cuts through the ridge in Rettig canyon. I can see the swale filling with water and emptying over the millennia, perhaps occasionally down Cortland Creek past the south tip of the Franciscan spike, as earthquakes and landslides rearranged the topography. The fault is mapped right at the intersection of Jordan and 35th on the west side, but I’ve never seen any evidence of creep there. The roadcut, according to the geologic map, should expose two kinds of bedrock. It’s covered with boulders of basalt or greenstone, presumably quarried from the spot. Bits of bedrock peek through, so it ought to be possible to trace the contact between the two rock types. That’s on my list of projects. 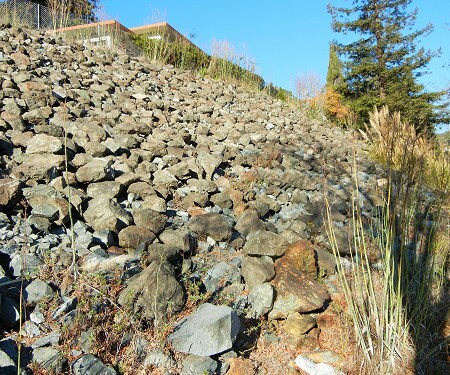 This entry was posted on 18 January 2014 at 5:25 pm and is filed under Franciscan rocks, Oakland geology puzzles, The Hayward fault. You can follow any responses to this entry through the RSS 2.0 feed. You can skip to the end and leave a response. Pinging is currently not allowed. That fill rock was brought in from somewhere. The hillside there slumped and closed the lanes – I’ve always been impressed there was no further slippage at that site. The slide occurred in the early 1980’s, iirc — I moved into the area in 1982 – it was only a year or two later the hillside slid. Thanks for that info; how interesting. There really is a string of destruction along that little ridge from the temple down to its tip here. Also, that should teach me always to check the lot lines in Google Mapsit shows about a dozen vacated lots on this stretch of the road. I know a man whos family sold them some of his property for the widening of the road, I can ask him u would like? He might have some interesting detail. That would be fun to know about if the subject comes up in conversation, or if he visits this post. Hello, My husband and I are wondering if it would be safe/wise to buy a home on Willis Court which is right off 35th one block down from Jordan. 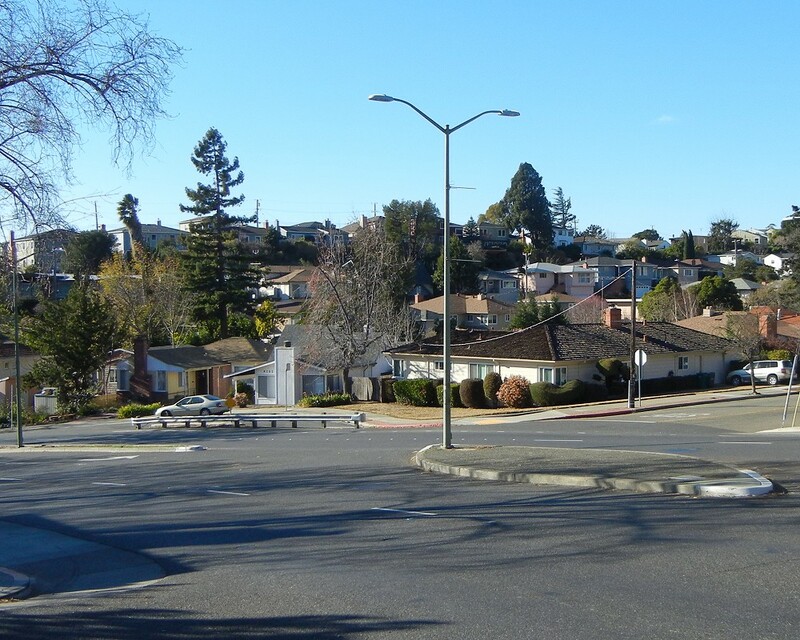 The main geological factor in that area is, of course, the Hayward fault. The USGS and ABAG have extensive resources that can easily be found through Google. I’m not a licensed professional and cannot give detailed geological advice. However, if the home is close enough to the fault that there may be a risk of fault movement damaging it, the owner is obliged to inform you of that under the Alquist-Priolo law. Otherwise, you can assume that the house will be subject to the maximum degree of shaking during a large quake here. The state’s Alquist-Priolo map is available at http://www.conservation.ca.gov/cgs/rghm/ap/Pages/Index.aspx to help you judge the seller’s disclosure report.